Covering the White House for more than 50 years, Helen Thomas would signal the end of news conferences with her signature line, “Thank you, Mr. President.” Thomas started with United Press International in 1943, later becoming the first woman to hold the position of Washington bureau chief for a wire service. Often called the dean of the White House press corps, Thomas retired from UPI and became a syndicated columnist for Hearst Newspapers. She asked critical questions in presidential news conferences and White House daily briefings in the months prior to the Iraq war. Helen Thomas remembers asking the out-spoken Martha Mitchell, wife of Attorney General John Mitchell, about the issues of the day when Mitchell gave Thomas an unexpected answer that received attention from her unsuspecting male colleagues. Enrolled in Wayne University (now Wayne State University), Thomas majors in English and works on the newspaper The Daily Collegian. Thomas moves to Washington, D.C., after graduation and stays with a relative while looking for a job. She starts off as a hostess at the Neptune Room before breaking into journalism as a copy girl at Scripps-Howard’s Washington Daily News, earning $17.50 a week. Eventually promoted to reporter, she and other Washington Newspaper Guild members ask for a raise and instead get fired. Thomas joins United Press, which later becomes United Press International. Working for the City News Service, Thomas contributes to the news wire that provides news for government agencies and Washington bureaus of other news agencies. She also writes local radio news. Pushing for a steady beat to cover, she follows what she called the “kitchen sink” beat, bringing her to the Justice Department, the Post Office, the Federal Communications Commission, the Interstate Commerce Commission and the Department of Health, Education and Welfare. Roaming up and down Pennsylvania Avenue, Thomas picks up various releases and covers a wide range of events including the Supreme Court’s landmark decision in Brown v. Board of Education . As standard practice, whenever heads of state or presidents came to visit, the State Department held news conferences or speeches at the National Press Club, which did not allow women to attend. In what Americans hoped would be a turning point in the Cold War, Nikita Khrushchev – the first Soviet head of state to visit the U.S. – was to attend a summit with President Dwight D. Eisenhower at the Press Club. Thomas and other women protest being barred from the meeting and are eventually granted permission to attend the luncheon. It would be the first time that women are allowed to attend a luncheon at the National Press Club. Thomas becomes president of the Women’s National Press Club for the 1959-1960 term. Throughout the next decade, she and other female journalists continue to lobby the National Press Club for membership. As president of the Women’s National Press Club, Thomas invites Nina Popova, head of the Soviet Society for Foreign Friendship and Culture, to a luncheon. It is during a question-and-answer period that she is invited to tour the Soviet Union, which she does later in the year. Beginning on the campaign trail and reporting at a time when women were rarely assigned to cover anything more than the first lady, with persistence and gumption, Thomas covers the work of the president on holidays and weekends, elbowing her way onto the White House beat. After nearly two decades of struggling to get women admitted into the National Press Club, 24 women are finally accepted. Within months Thomas is elected financial secretary of the Press Club. As the only female print reporter to travel with Richard Nixon on the first U.S. presidential visit to China, Thomas witnesses a trip that was viewed as the first step to normalizing relations between the two countries. Soon thereafter, John Mitchell formally resigns from the campaign, and in February 1975, he is convicted of perjury, obstruction of justice and conspiracy for his role in Watergate-related crimes. Promoted to a newly created management post, Thomas earns the position of White House bureau chief and is the first woman to serve in that capacity for any wire service. A few weeks after President Nixon’s resignation , while covering President Ford on a Sunday at church, Thomas is the first to learn that Ford was to announce his pardon of Nixon from any prospective Watergate-related prosecutions. Elected the first woman president of the White House Correspondents’ Association, Thomas is also invited to join the Gridiron Club as its first female member, becoming its president in 1993. Thomas’ her first book, “Dateline: White House,” is published. Thirteen years after winning the battle to be admitted into the National Press Club, Thomas is honored with the Fourth Estate Award, club’s most prestigious award. Thomas is the first woman in the club’s history to receive the honor. Thomas participates as a moderator during the presidential election. At the White House Correspondents’ Association dinner, Thomas is surprised to be awarded a newly instituted Helen Thomas Lifetime Achievement award for White House Reporting, with video remarks given by first lady Hillary Clinton. “Front Row at the White House: My Life and Times,” Thomas’ memoir examining her professional life, is published. The day after UPI is sold to News World Communications Inc., founded by the Rev. Sun Myung Moon, the leader of the Unification Church, Thomas resigns . Shortly after, she is hired as a columnist by Hearst Newspapers. In a second memoir, “Thanks for the Memories, Mr. President,” Thomas recalls lighter and more humorous anecdotes of her career. Between Sept. 11, 2001, and March 20, 2003, when the U.S. invasion of Iraq began, columnist Thomas asks some of the most consistently skeptical Iraq-related questions of either President George W. Bush or the White House press secretary Ari Fleischer. For example, Thomas asked Fleischer at the White House daily briefing, “What is the president’s rationale for invading Iraq?” She asked Fleischer follow-up questions, challenging the stated reasons for a war with Iraq. Thomas, a Hearst columnist expected to write her opinions, could no longer hide her low opinion of President Bush, whom she publicly describes as “the worst president in American history.” President Bush refuses to call on her in his last news conference before the invasion of Iraq , an occasion in which no reporter directly asks why America was about to start a war. In her fourth book, “Watchdogs of Democracy? The Waning Washington Press Corps and How It Has Failed the Public,” Thomas writes about the decline in the quality of reporting in the nation’s capital. In her sixth book, “Listen Up, Mr. President: Everything You Always Wanted Your “President to Know and Do,” Thomas and co-author Craig Crawford discuss qualities needed to be a successful president, providing historical examples. The Falls Church News-Press hires Thomas to continue her weekly political affairs column. “Dateline: White House.” New York: Macmillan, 1975. “Front Row at the White House: My Life and Times.” New York: Scribner, 1999. “Thanks for the Memories, Mr. President.” New York: Scribner, 2002. “Watchdogs of Democracy? The Waning Washington Press Corps and How It Has Failed the Public.” New York: Scribner, 2006. “The Great White House Breakout.” New York: Dial Books, 2008. “Listen Up, Mr. President: Everything You Always Wanted Your “President to Know and Do” (with Craig Crawford). New York: Simon and Schuster, 2009. Falls Church News-Press, “Veteran Journalist Thomas Resumes Column in News-Press.” Jan. 6, 2011. “Helen Thomas Announces Retirement,” Hearst Newspapers, Press Release, June 7, 2010. 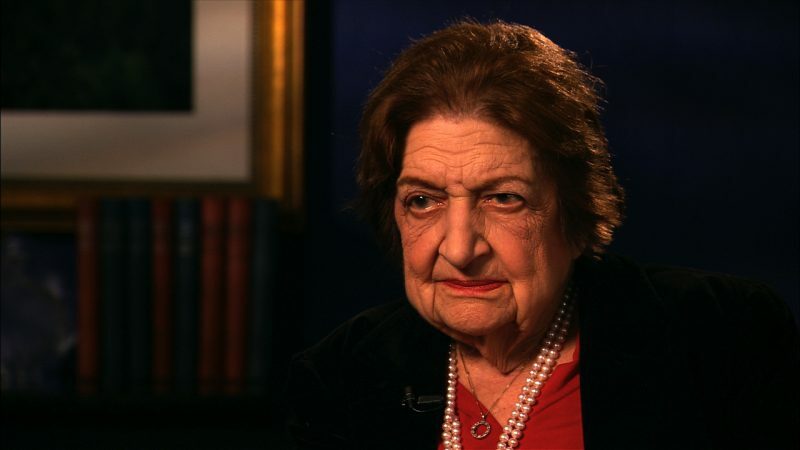 “Helen Thomas: The First Lady of the Press.” Biography, The History Channel. A&E Television Networks, 1998. Isikoff, Michael and David Corn. “Hubris: The Inside Story of Spin, Scandal and the Selling of the Iraq War.” New York: Crown, 2006. Charles Lewis interview with Helen Thomas, Dec. 13, 2007, Washington, D.C.
Thomas, Helen. “Front Row at the White House.” New York: Scribner, 1999. Shafer, Jack. “Screw You, Mr. President.” Slate, March 12, 2003. Stout, David. “Helen Thomas, Washington Fixture, Resigns as U.P.I. Reporter.” The New York Times, May 17, 2000.